A New Series on the Top New Suspense Writers. Make way for Dewey Andreas by author Ben Coes, Nathan McBride by author Andrew Peterson, Court Gentry by author Mark Greaney, and Jonathan Grave by author John Gilstrap. These are the lead characters in four recent series of suspense thriller novels that deserve our attention. When I say new, I mean most of these have been written since 2009 and the authors are writing more in their series. Do You Love Mitch Rapp? Scot Horvath? Are you a fan of Jack Reacher? Mitch Rapp? Scot Horvath? All three are impressive, enjoyable characters. Those three names will be very familiar if you read the suspense thriller genre of fiction. 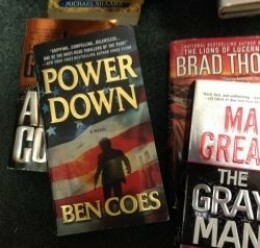 They are three of my favorites, along with Tom Clancy, so I will read or listen to every book in their series. The authors, Lee Child, Vince Flynn, Brad Thor, have done a very satisfying job of supplying multiple books centered around their main characters. If you’ve read any and liked one, you’ve probably sampled them all. Lee Child is nearing twenty books. Vince Flynn had completed thirteen when he died in 2013. Brad Thor has thirteen published to date. As a reader you’ll understand what a pleasure it is when you find there is not just one book, but an entire series to look forward to reading. Still, when a story is as fast moving as these they are hard to put down, so you tend to finish each book fairly quickly. Rather than be done with each series too fast, I went on a hunt for more authors with similar characters. I found several excellent writers, some of which you may know. Over the next several days you can learn more about each of these authors and their books. I’ve found myself very attached to the characters by the four authors shown here. There are far more here than featured, so this series may go on indefinitely. I’m thankful there are so many imaginative writers who are so able to write such exciting, entertaining stories. To begin, watch for part two of this series. I just finished Eye for an Eye by Ben Coes. So we will start with him. Besides Mr. Coes, you will meet Mark Greaney, Andrew Peterson, John Gilstrap and Brett Battles. I’m sure others will join their ranks as well, as not-to-be-missed writers of suspense thrillers.